Six days after being made available to the public, OS X Yosemite was installed on approximately 12.8 percent of Macs in North America, according to adoption numbers released by Chitika. That's just a slight bit higher than the 12.4 percent of Macs Mavericks was installed on six days after its release in 2013. Ahead of its launch, Yosemite adoption by beta testers and developers was more than 33 times higher than the adoption of Mavericks, and as measured by Chitika, its one percent share of North American Mac OS X-based Web traffic on the first day after release was double the day one adoption rate of Mavericks and Mountain Lion. OS X Yosemite may be seeing slightly faster adoption rates as the operating system introduces a complete visual overhaul along with several features that allow it to deeply integrate with iOS 8. While Mavericks focused heavily on under-the-hood updates that improved battery life and responsiveness, OS X Yosemite brought revamped apps, Continuity, Notification Center improvements, iCloud Drive, and more. 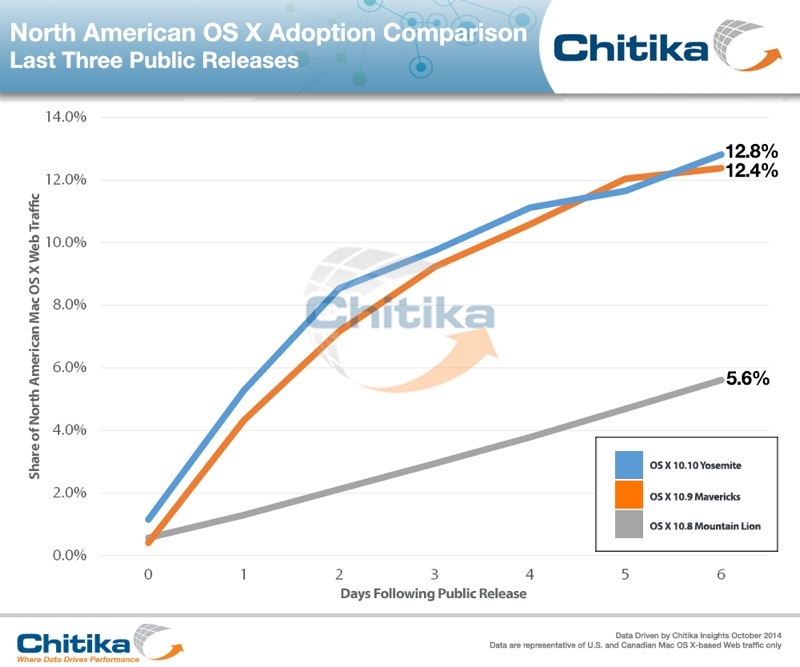 Chitika also speculates that the OS's public beta may have positively impacted its adoption numbers. Apple had previously made a public beta of the OS available for the first time in the company's history, and this seems to have helped boost initial adoption rates slightly beyond what was observed for OS X Mavericks back in 2013. Chitika's numbers are drawn from millions of U.S. and Canadian Mac OS X-based online ad impressions from the Chitika Ad Network. Chitika measured ad impressions from October 16 to October 22 to acquire its data. 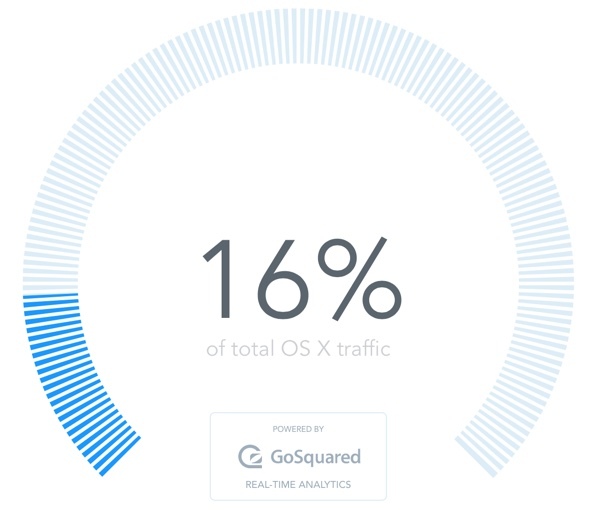 Similar but somewhat higher numbers are being reported by GoSquared, which offers real-time analytics that measure OS X traffic. According to the site, Yosemite is installed on approximately 16 percent of Macs, though numbers fluctuated up to 10 percent over a seven day period as GoSquared measures real-time visits to more than 50,000 sites. I'm still on 10.6, LOL! For comparison, windows 8 and 8.1 makes up only 12.26% of all PCs. Yosemite outpaced that in less than a week. Still lower than I think it should be. I can understand though -- my parents don't even know what Mavericks / Yosemite is, and just stay on Mountain Lion (that came with their iMac). No doubt there's a lot of people that are just oblivious to free upgrades, not to mention many users that stay on older versions to remain compatible with specific software. I'm staying on Mavericks on my 2012 Mac Mini, I like it and frankly I'm afraid to update. I don't need any more problems, the latest iPhone iOS 8 has been enough problems for me. I need some consistency. I'm still upset that Apple forced iTunes 12 to update on my system automatically, I never wanted to update to 12 and I ticked the box not to update and it did it anyway. Yea that 12.26% is part of a MUCH larger number. That's like there being only two Macs in the world and one had Yosemite installed. Then it would be 50%. Gotta love how they twist the truth. It's a good OS. I skipped the Lions and went to Mavericks. Still waiting until at least .2 or .3 for Yosemite. Eh, weak argument. Nearly half a billion iPhones have been sold and more than half of all iPhones are running the latest OS. And apple's software updates are easy and free, unlike windows. I had to remove it from my early 2009 iMac. It wasn't running smoothly at all, got the swirling rainbow icon too many times. Slow, 8GB of ram was just not enough to handle it. Mavericks was ok, still a bit slow. Mountain Lion is where I ended up, perfect for what I need it for. Mountain lion and mavericks to me were a perfect upgrade, stable .0 release. Not sure about yosemite with the new look, might wait for .2 or .3 releases. I told myself the day before public release I was gonna wait a few weeks. Then proceeded to download the first 30 minutes it hit the App Store.